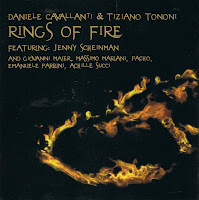 Italian tenor saxophonist Daniele Cavallanti and drummer Tizian Tononi, created a new project, composing two suites "Faces & Phases", to be played by some of the best Italian musicians, and with Jenny Scheinman on violin as the guest star. The "Faces"part, composed by Cavallanti, focuses on modern movie directors, including "Cassavetes", "Bertolucci", "Jarmush", "Wenders" and "Eastwood", the "Phases" part, composed by Tononi, are more inspired by nature. The Italian musicians include Giovanni Maier on bass, Massimo Moriani on electric guitar, Pacho on percussion, Emanuele Parrini on viola, and Achille Succi on bass clarinet and alto saxophone. The music brings a strange mix of modern jazz, fusion, rock, folk music, world music, avant-garde and free moments. The original idea was also to use the infinite possibilities of interaction between the two horns, the two strings and the guitar, together with the clear objective to create "lyrical tension, drama, power but at the same time always under control". And I must say, that they managed to make this programmatic approach come true. Not only are the musicians excellent, but so is the music. "Faces" is melodic, starting in an avant-garde fashion, moving on into "Cassavetes", possibly the most jazzy piece of all, eery and agonizing. "Jarmush" is uptempo, a little more funky and fusion, whereas "Wenders" has a propulsive rock drive with heavily distorted guitar solo, yet "Eastwood" is the best piece, a great mid-tempo workout with excellent solos from Cavallanti and Scheinman. "Phases", also starts very avant-garde, with eery and screeching sounds like seagulls crying overhead, accompanied by singing whales, with the guitar and drums intervening with some some more industrial sounds. "Motionary Tales" has more drama, with strong unison theme, evolving into a lighter tune with a steady beat, over which the soloists do their thing, although all accompaniment slowly ebbs away before the viola give as a gripping solo. "Before The Storm", the second long track, is much slower, with a great wild part in the middle, where all the solo instruments have a kind of battle for share of voice, only to rejoin a theme for a march-like tune. But I like "Landschape # 2" the best, with a combination of a folk tune with world music influences, a great bass clarinet solo over great percussive work by Pacho and a beautiful viloa solo by Parrini. Variation enough, actually the tunes changes every few minutes, even the longest ones, yet despite that, the whole is pretty coherent. For some listeners there might be a little too much stylistic variation, though. This album consists of two tracks : one 50 minutes long, the other 5 minutes. 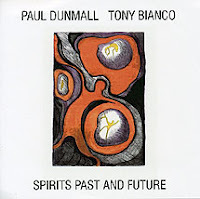 Dunmall plays tenor, Bianco drums. And the first track is long, it goes on and on and on, with shifts of intensity, sometimes slower, sometimes harder, interspersed with some drum solos, mostly with both musicians having a go at it, without restrictions, pushing each other on and interacting well. Fifty minutes is long for a duo to keep the attention going, yet at the same time it offers so much room for expansion, which they use as much as they can, and there's a reason why it doesn't stop. No constraints, no restrictions. Out there. Moving as you wish. Free. 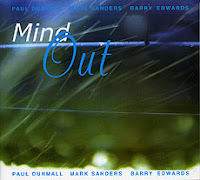 This trio consists of Paul Dunmall on tenor and soprano saxophones, Barry Edwards on guitar, and Marks Sanders on drums. The session was recorded in Bristol on 17 October 2007. It is a little calmer than "Spirits ...", more subdued at moments, which is certainly due to Edwards's presence. His guitar playing is minimalistic to say the least, yet his influence on the band's overall sound is important, his soft playing adds color and shadings throughout, and he creates the same effect as when someone starts whispering in a group of people, then everyone quiets down and starts listening more closely. His quiet playing, often with muted strings, limits the powerplay and makes for some sensitive moments, yet they can also move into very nervous intensity. Edwards also often uses his bass strings to accompany the band in the fiercer moments. Dunmall is as usual, keeping the energy going, playing continuously, often within the same mid-range of the instrument. The best parts are when guitar and sax intermingle in contrapuntal dialogue, full of chaotic sparks, with Sanders interacting perfectly, pushing guitar and sax forward. Lots of variation, lots of listening fun. Sparse cello ... minimalistic piano ... snippets of sax ... interweaving ... telling stories full of surprises ... gently ... creatively ... open and free ... full of emotion ... beautifully. What can I say more? What need I say more? 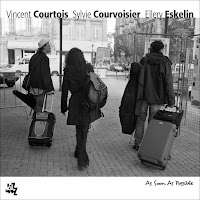 Maybe that the three musicians are excellent : Vincent Courtois on cello, Sylvie Courvoisier on piano and Ellery Eskelin on sax. All three are wonderful improvisors and great masters of their instruments. The first track is a pointillistic beauty, the second is more jazzy, with a strong pulse and a powerful sax solo. The third track, the title song, is a hesitating abstract piece with lots of extended techniques evolving from near silence to a wonder of a highly discplined raw aesthetic. "Nocturne" is more melancholy, with bowed cello and soft piano accentuation, yet keeping far away from cheap sentiments, although there are references to the melodramatic accompaniment of silent movies, up until the sax joins, when the cello takes on a rigid repitive phrase, and the horn brings darkness and fear into the proceedings. The highlight of the album is the long "Mesure D'Ailleurs", starting in a very avant-garde mode, but all three musicians manage to bring a lyricism and emotional depth that is unusual for such a break-through approach. "La Fontaine De Mars" is equally interesting, with the cello creating an otherworldly electronic rhythmic sound, supported by plucked piano strings alternated with the regular keys, dark, gloomy, agonizing, over which Eskelin weaves beautiful notes together. The other tracks are all of the same level, varied, with unexpected twists and turns, yet always with a gradual build-up and carefully controlled closing. The true value and power comes from the totality of what you hear, as it should be, yet so difficult to achieve in improvisation. The musical coherence of what this trio brings is absolutely stunning, creating on the spot what sounds like perfection. Their attention to detail, with every note or sound where it should be, as if lots of thinking went into it, is amazing, as is the way they find each other blindly in the improvisation, speaking the same language, despite the boundary-breaking approach ... What can I say more? What need I say more? You may or may not know my love for trumpet trios, my admiration of Kahil El'Zabar, Lester Bowie and Malachi Favors, but here it is. This was the initial Ritual Trio, but then Lester Bowie passed away. They recorded one album : The Ritual, playing the Art Ensemble's composition "Magg Zelma". When browsing the internet last night, I came across this download, which I want to share with you. It's a bootleg recording of high quality, recorded for a German radio station, bringing new improvisations by this excellent trio: great music, soulful, modern, open and free. Download Kahil El'Zabar/Lester Bowie/Malachi Favors here (link removed - album now commercially available). The cello trio in jazz is an unusual line-up. Recently Erik Friedlander released his Broken Arm Trio album with cello-bass-drums, and before him Fred Lonberg-Holm and David Eyges come to mind. Now David Levin has done the same, and quite well even. The album does not have the great atmospheric feel of his "Blurry", going for a more direct, raw approach, but assisted with two stellar band-members Ingebrigt Haker Flaten on bass and Gerald Cleaver on drums. On the album the compositions vary between real jazzy tunes, with a strong rhythmic backbone to more modern work-outs. In stark contrast with his previous albums is the nervousness, the drive, a little more tormented, or even hypnotic and eery at moments, but always rough and moving on, with the title song already setting the stage from the very beginning. The second track "Shape" is built around some odd rhythmic patterns. The traditional, "Hangman", is absolutely brilliant and dark, starting with the melodic tune played by cello and bass played with arco, and evolving into eery soundscapes. For the following tracks, I am not too sure what happens, but I loose attention. It might be that I'm tired, but it may also be that the trio reaches a limit of possibilities. But it ends well again, with "Wood", a great kind of rubbing shoulders between cello and bass, sounding like lovesick whales courting one another. And once you're fully into this weird intimacy, all hell breaks loose again, with the last track, "Wiggle", on which the trio unleashes its true jazz power by bringing a long high tempo tribute to Jimmy Lyons. The cello trio has of course its limitations. The lack of vocal power of the cello next to bass and drums makes it a hard task to keep the same drive at with a tenor leading the tracks, but nevertheless, this trio really manages to play some great stuff, even if not all the tracks are of the same high level. Watch a recent performance by the trio (relatively calm compared to the CD). Joëlle Léandre is the great lady of the bass, totally rich in ideas, open to new things and new collaborations and totally uncompromising. Always looking for new things, new forms of expression. This record is in its breadth a worthwhile addition to her long discography. 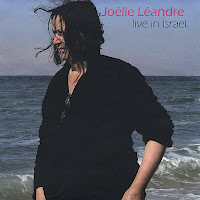 It was recorded in November 2007, catching her performance with several line-ups of Israeli musicians. It starts with seven improvised pieces for solo bass. To me, this is by far the best part of the record, because Léandre demonstrates her great skill at creating wonderful, beautiful, heart-rending sounds out of her instrument, especially when played with the bow. It has an unusual combination of purity, depth, substance, warmth and volume. The improvisations are timeless, universal, beyond musical categories, varying from lyrical explorations, over jazzy moments to plain avant-garde. On the second CD are four sextet improvisations with Assif Tsahar and Albert Beger on tenor sax, Ariel Shibolet on soprano, Haggai Fershtman on drums, Daniel Sarid on piano. There are some nice moments, but also some chaotic ones, with sometimes a little sense of direction missing. These are followed by four trio improvisations with JC Jones on bass and Steve Horenstein on sax, and I must say that I am impressed by these two double basses interacting, and especially by Horenstein's perfect match for it. The basses lead and the sax adds color. Léandre sings on one of the tracks (instead of her usual shouting as on some other tracks), again creating a musical environment which is totally out there and highly uncommon, but again again, she does her thing, and it works. The rich and varied record ends with duo improvisations with Sameer Makhoul on oud and vocals. This is again a highlight of the album, with Léandre also working perfectly in a supporting role for Makhoul's subtle and sad playing. Then she joins his sad singing, wordless and equally sad, adding some drama, while playing arco at the same time. The last track is superb, because Léandre turns this traditional music into a more adventurous space, and the oud follows suit, improvising and interacting as if they'd played together forever. Not everything works well on this album, but it has some truly great moments. Fusing musical styles is often an alibi for lack of creativity within one specific idiom. You mix a lot of ingredients and hope the end result will still be tasteful, edible and digestible. More often than not this is not the case. It demonstrates a lack of real creativity and a lack of musical vision. It is all about form, about the art of the mixing itself, rather than about content, as a way to express feelings, of even new musical ideas. To my great regret, my fellow countrymen of AKA Moon, under the leadership of saxophonist Fabrizio Cassol, have gone down the same road, mixing Bach's Matthew Passion into jazz. True, it was originally composed as background music for a dance company (not by Bach, of course), and maybe it should not be evaluated for its musical value alone, but the mixture is there, and available on CD. AKA Moon is a great trio, with three great musicians, and in recent years they have created albums with expanded stylistic approaches, adding other musicians, possibly in order to get fresh ideas, but I think their trio format is still the best. They have played music from India, from north Africa, from central Africa, all with musicians from these regions, a fusion guitar album, a cross-over stint with Ictus Ensemble, and now they're back into classical regions. The question one might ask is : why? It's indeed a new musical project, but the styles don't mix, at all. "Pitié" means "Mercy", and that is what we are all begging for : make real music, straight from the heart, not exercises in empty form. 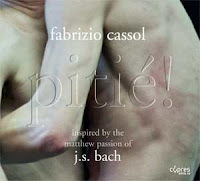 See an excerpt from "Pitié". Jazz has often incorporated spirituality, especially with Coltrane and Ayler, but also as recent as with Trio X, yet here is another fine example from Norway. 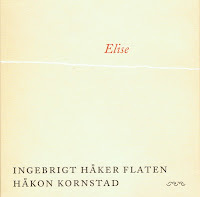 Bassist Ingebrigt Håker Flaten and saxophonist Håkon Kornstad together bring this utterly modern, yet reverent, rendition of traditional Norwegian hymns, collected at one time by the bassist's grandmother, Elise Flaten. On the first track, she can be heard singing, as one of the many recordings she made for the country's national radio, in an endeavor to preserve this music from disappearing (In terms of style this is as far away from The Thing, Scorch Trio or Atomic as you can imagine). The two musicians do not play these melodies as such, of course, they are inspired by them, using the themes to expand on, or even improvising pieces in the same spiritual mood, as well as a cover of Jarrett's "Death And The Flower". The music is calm, more inside than outside, soft, peaceful, joyous at times, yet mostly subdued, deeply felt, with an incredible emotional warmth. 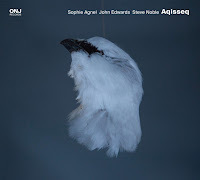 At times some ECM musicians come to mind, like Garbarek, John Surman, or the "Without Words" album by Peter Epstein and Miroslav Tadic, but whereas all those musicians are expansive in tone, as if played outdoors with the sky and the horizon as the boundaries, this album is very intimate, as if played indoors next to a warm fire. The two musicians do not demonstrate instrumental pyrotechnics, except from the occasional multiphonics by Kornstad, but lots of precision and creativity in bringing very modern jazz based on folk tradition, keeping away from cheap sentiment, managing to be rich and restrained at the same time, true to the source material and so free at the same time. A heart and soul-warming album. Long time collaborator of Anthony Braxton, trumpeter Taylor Ho Bynum is carving out his own style of music, and with success. Next to his duets with Braxton, his trumpet-drums duets with Tomas Fujiwara and Eric Rosenthal are also easy to recommend. He created some albums with larger ensembles, but I thought he never found the right angle or tone, yet it was obvious that he was searching to create his own voice. And with this album he has achieved this, and that's not a minor feat. His sextet further consists of Matt Bauder on tenor saxophone and bass clarinet, Jessica Pavone on viola, Mary Halvorson and Evan O'Reilly on guitar, and Tomas Fujiwara on drums, or the same band that released last year's "The Middle Picture". And although I am aware that my musical tastes are also changing, I find this record so much stronger. The composer still uses musical influences from many genres, especially on the long "whYeXpliCitieS (part III)", on which jazz converges with latin, and traditional dance music and african rhythms, but with a very minimalistic approach, interweaving sounds together like a piece of lace, complex patterns with lots of delicate openness. The album starts and ends with solo cornet, the second track brings a tightly composed unison theme for guitar and cornet. 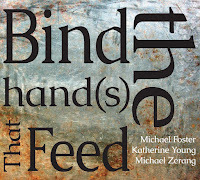 But the centerpiece, "whYeXpliCitieS", in three parts, played by the whole sextet, carries the weight of the album, starting with rock guitar, full of violence and howling feedback, but when the dust settles, beautiful and gentle interplay emerges, with pizzi viola, muted cornet, acoustic guitar, bass clarinet and brushed drumming, but tension arises when this construct breaks down into individual parts, coming together at the end in highly intense chaos. The second part starts with a very asymmetric and odd-metered unison theme for cornet and guitar, and the other musicians join the lyrical contortion, with Bauder's sax solo being the highlight. On "Goffstown", Fujiwara leads the theme, with a drums intro which brings us halfway the piece, when Ho Bynum and O'Reilly join for a beautiful theme. 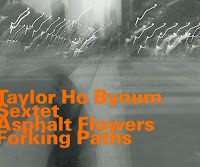 Ho Bynum managed to create a style which is melodic, yet full of character, fun to hear, yet full of substance, mixing complexity with a unique voice. Great stuff. Ab Baars is a Dutch saxophonist & clarinettist whose music has been described as "joyfully obstinate", and that's indeed the case. It is music stripped to its essence of interacting sounds, without any recognizable themes or structure, and yet the music is full of lyricism and rhythm, however implicit it may be. His trio further consists of fellow countrymen Wilbert De Joode on bass and Martin Van Duynhoven on drums. They are joined here for the occasion by Ken Vandermark. 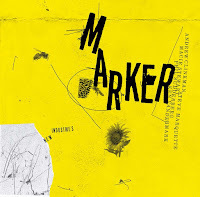 The two tenorists find each other well on this album, and most of the credit goes to Vandermark who adapts quite well to the Baars's musical approach. Obviously, that should be no surprise in the more jazzy pieces, as in "Straws" or "Waltz For Monk", but more often than not the music is calm with abstract motifs and careful interplay. On "The Memory Moves Forward" Baars plays his shakuhachi, the Japanese bamboo flute, and it is easy to say that the zen-like approach of less is more, also permeates many of the other songs. But don't get me wrong : this is far from music for meditation, it is too active, too unexpected and too full of surprises for that. The title track, is suddenly totally jazz, full of funk, a real Vandermark tune, although composed by Baars, and some tracks which I thought were by Baars, are apparently composed by Vandermark. I must say that I have rarely heard him play in such a subdued and abstract way as here. Some tracks, such as "Prince Of Venosa", or the last one, "Lunch Poem", illustrate this well, bringing drumless soft movements of silence, with the horns intertwining, moving away and coming back, and with the most limited bass activity I have ever heard on record. It is a little bit too abstract to my taste though. It takes guts to invite reputed musicians such as Pheeroan akLaff (drums) and Tony Malaby (sax) for a debut album, because they have created their own approach to music over the years. 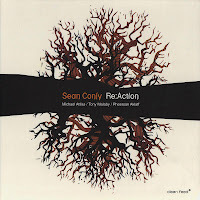 Add the second tenor of Michaël Attias to that, and you can only admire bassist Sean Conly to make this musical project really his own. He has a composing style which is very coherent : very rhythmic and often angular themes with stops and starts for dramatic effect. Yet on the other hand, he gives his band members sufficient space to work around the compositions, and it is in listening to the improvisations that you start to understand why he selected them. Not only because they are good, but because they understand Conly's musical approach without relinquishing their own style, especially Attias and Malaby fit well together, both free and sensitive players, stylists who know how to express emotions, with akLaff using his incredible wealth of ideas and experience to provide the necessary depth and contrast. The compositions are accessible without being mainstream, with long unison themes, and relatively controlled improvisations. On "Concrete Garden", ambient sounds are used, with some post-production, and it is the most overt sign of rock influences on the album, but they are present throughout the pieces, giving a powerful drive to the music, as on "Ulterior Motives", an uptempo rocker with a great theme and some wild soloing. The same approach is to be heard on the dramatic "Saitta", a real tension-builder, as is "Suburban Angst". 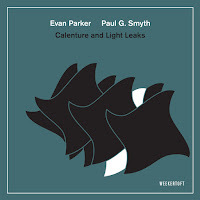 Yet the music is as good on the slower pieces, as on "Luminiferous Ether", an duo improvisation between Conly and Attias, or "Refutable", allowing the saxes their full sensitive expressivity. This latter track is a beauty of restrained emotional power, with the two saxes circling around each other, tentatively, sensitively, played over a repetitive bass vamp and some subtle accentuating on the drums. And that's possibly Conly's strongest achievement : to make the whole band perform great music, with lots of variations, but it's primarily on the slowest pieces that the best results are achieved, possibly because of none of these pieces have clear melodic themes, and hence free-er in their concept. But again, it's without a doubt the variation that makes this album a great piece of music. And apart from being a good composer and band-leader, Conly is a great bass player too. We want more. This is the kind of chemical lab environment situation : put Evan Parker on tenor saxophone in a test tube, together with Scandinavia's power rhythm section, consisting of Sten Sandell on piano, Ingebrigt Håker Flaten on bass, and Paal Nilssen-Love on drums, then wait and see what happens. From a chemical reaction perspective, actually the strangest thing happens : you don't need to add energy (heat, electricity, movement, ...) before something takes place. Before you know it, the four start heating up, exchanging molecules and atoms, sizzling, boiling, smoking, splashing in all directions, overflowing at times, then, after lots of heat dissipation, the whole coagulated thing starts cooling down and desintegrating again, into a sax solo, a bass solo, some plucked piano strings, the odd cymbal clash, for some odd slow intermingling of colors and lines, mixing without energy, with a flash here and there, yet cooling down into an almost absolute calm. All jokes aside, it is in this superb variation of subtle sensitive and intimate moods which evolve into powerful expansive outbursts and then back again, that this music gets its unbelievable vitality. But there is more, the way these four musicians move together into the same musical direction is at times hard to grasp, especially because they move into uncommon regions, where sensitive hesitation and assertiveness reign together, creating interesting dialogues and, well, great and very coherent music. The two lengthy pieces, each 45 minutes long, allow for the musicians to take their time to create and expand. Listen and download from eMusic (and in eMusic terms : this costs only two tracks, or a double CD for the price of two songs). For once not a review, but an announcement. 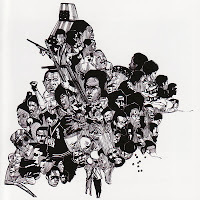 The Italian jazz labels Black Saint and Soul Note have meant a lot for modern jazz history, were recently acquired by Cam Jazz and made a big part of their catalogue available on eMusic. This means that lots of older music, which was really hard to get is now available again : Leo Smith, Archie Shepp, William Parker, Steve Lacy, What We Live, Julius Hemphill, The World Saxophone Quartet, Andrew Cyrille, Anthony Braxton, Paul Bley, Dewey Redman, Oliver Lake, Andrew Hill, Jemeel Moondoc, John Lindberg, ... but also lots of Italians : Paolo Freso, Furio Di Castro, Gianluigi Trovesi, Enrico Pieranunzi, Tiziano Tononi ... All names of musicians who themselves have changed jazz and the history of music. 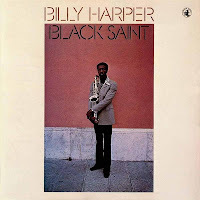 The initial Billy Harper record "Black Saint" (1975), with which is all started, is also available for download. As Bill Shoemacher writes on the label's home page : "So, the clarion call – Black Saint & Soul Note Ride Again – is welcomed news for persons for whom jazz is a burning passion." Go to eMusic : select label and check under Black Saint and Soul Note. True, this isn't exactly free jazz, quite on the contrary, it's very much composed and arranged, with the exception of three fully improvised tracks. Canadian cello player Peggy Lee feels as comfortable in an avant-garde environment as in a more traditional context, and on this album she mixes both, creating an interesting and quite enjoyable synthesis. The overall sound of the album is a continuation of what other musicians like Bill Frissell or Michael Blake started, jazzy rock sounds, carefully arranged, but instead of having the anger of rock, the whole thing is enveloped in a blanket of warmth, even on tracks like "Not A Wake-up Call", on which the electric guitar goes haywire. The band consists of Ron Samworth and Tony Wilson on guitar, Brad Turner on trumpet, Jon Bentley on tenor, Jeremy Berkman on trombone, Peggy Lee on cello, André Lachance on bass and Dylan van der Schyff on drums, a complete Canadian band if you want. The melodies are beautiful, down-tempo, with layers of sound building up gradually, with the musicians playing soft improvisations over a fixed structure, but all very subdued, with the horns muted, and the guitars gently plucking the chords. Yet the antidote to so much sweetness is given at the same time. 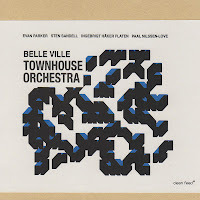 One of the most beautiful improvisations is the duet between cello and trumpet, and the following track, "Scribble Town" moves into real avant-garde, with guitars and cello making pointillistic dissonant sounds in the foreground, over a pre-arranged rhythmic horn section, while the rhythm sections goes berserk in the background, offering a wonderful opportunity for the sax to give a great solo over the total confusion. After so much madness, "Tug", brings us back into nicely arranged and homely music, with an interesting counterpoint structure, and a great trumpet solo. The album starts and ends with two covers : Bob Dylan's "All I Really Want To Do" and Kurt Weil's "Lost In The Stars" respectively. Peggy Lee surely created her own genre with this album, and I hope that listeners will have a sufficiently open mind to accept the often contradictory musical statements, that shift between smooth and sensitive music to harsh adventures, ending I Weil's fearlessly sentimental piece. Whatever route she chooses, the musicianship of her band and their coherent approach bring the endeavor to a great end. Listen and download your advance copy from eMusic. Codona is one of those truly unique bands that made music in total disregard of style, fashion or commercial interest, fusing elements from all over the world, Africa, India, Japan, Europe, North and South America into one sublime melting pot of beauty and musical joy. The band consists of Colin Walcott on sitar and tabla, Don Cherry on trumpet, flutes, melodica, doussn' gouni, and Nana Vasconcelos on percussion and berimbau. Now, their trilogy has been re-issued by ECM as one set, in its entirety, which is great for those of you who might be interested. And you should. Here is why. 1. Don Cherry may not be the greatest trumpeter of jazz history, but he is for sure a musician in the truest sense, someone who makes music (as opposed to someone who just plays an instrument). Even more, he takes his music to a higher spiritual plane, one of joy, one of global unity, one of world peace, but not in a shallow, bland way, but with lots of depth. Throughout his all too short life, he kept looking for new forms, joined every band or musician who was interested in playing music together. Member of the famous Ornette Coleman Quartet, member of Old & New Dreams, guest musician on so many other albums. He died too soon in 1995. 2. Collin Walcott is the spiritual person in the band, one of the few non-Indians who truly masters the sitar, having had Ravi Shankar as a teacher, but he plays it in a very western style. Founding member of Oregon. He died all too soon in 1984. 3. Nana Vasconcelos from Brazil, is a master of percussion, but also someone with great musical vision. He is someone who went miles beyond Latin rhythms, beyond musical genres and styles, carving out his own special place in modern music. Together, these three musicians brought a kind of music that no one had ever heard before and that no one has heard since. The music is rich, intimate, resourceful, composed, spiritual and free. Whether this band plays Ornette Coleman covers such as "Race Face" or "Drip Dry", or African traditionals, such as "Godumaduma", or Japanese such as "Goshakabuchi", the musical surprise, the wonder of small things, the pleasure of playing, the simplicity of the trio, it is all there : soaring trumpets, extatic shouting, dramatic percussion, disciplined rhythms, and joy, joy, joy. "Like That Of Sky", the long opener of the first album, is an incredibly new-agey tune, with Cherry's bamboo flute in a leading role at the beginning, sounding like music coming straight out of the jungle. Then the sitar and Vasconcelos Brazilian percussion join, Cherry switches to bell-clear trumpet, then back to flute, with dubbed background voices, with the tempo increasing during the piece, and Cherry's flute-playing is just again out there, full of joy, spirituality, soaring, singing, jubilating, dancing over the percussion and sitar. Or listen to "Mumakata", a real song, sung by all three musicians, over an African rhythm, again a rhythmic joy from beginning to end, with the trumpet sounds flying high in the sky, making even the birds feel jealous. Another absolute highlight is "Malinye", which is a kind of suite, starting with Cherry on melodica, playing a beautiful melody on this unusual instrument, with Vasconcelos' rumbling percussion joining, and Cherry singing the African traditional, then Walcott joins, but when Cherry switches to trumpet, the skies tear open, clouds disappear, the sun starts shining, every person hearing this tune stops in his tracks, thinking "what is this? ", and true, it is the most uplifting tune you and anyone else have ever heard in the history of mankind. 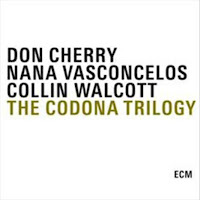 Or listen to the short "Walking On Eggs" a Walcott composition, which is so jazzy, so rhythmically enjoyable, that by itself it is worth the purchase of the whole trilogy. The music at moments sounds naive, but then in a high quality form, full of child-like wonder and good intentions, yet the wealth of musical baggage these musicians bring is staggering, from traditional blues (Cherry's "Clickety Clack"), to more avant-garde pieces ("Trayra Boila") or even minimalist repetitive ("New Light"), or plain jazz, it is fun, it is pure, it is essential, lifting the music well above the naive (and often boring) simplicity of so much new age or world music. This music is artistically relevant. It does not fit into any category. It is unique music. Because of that it did not influence musical history at all. I do not think that any other group of musicians would have been able to even copy Codona. Yet it is absolute essential music. Regardless of musical preference. Maybe with the exception of some other albums by Don Cherry, there is not much music which brings this level of simple pure spiritual joy, rich and deep at the same time. It is zen, it is tribal. It has an earthly feel, with deep roots, yet it is music of the skies too. All in one. Listen and download from iTunes for only 17.99 euro. But I would recommend you buy it in hard copy. Avant-garde from Russia, with Ilia Belorukov on sax, Roman Stolyar on piano and melodica, Andrey Popovskiy on acoustic guitar, and Alexander Funtikov on trumpet, ocarina and percussion. The music is dark and sensitive, full of restraint. The title indicates that it is abstract, but in reality that's not the case all the time. 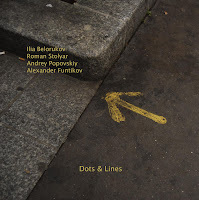 Some pieces, like "Scherzo", certainly are, and consists of musical dots placed next to each other, tiny fragments of sound coming from the various instruments, filling a canvas. Other tracks are more fluent, with the sax or flute playing hesitating melodies, with a piano which could be playing the soundtrack for a scary movie. Despite the title, the music is not about form, as you might think, but about emotions. The record starts in full anger, with a baritone sax blaring out sounds, but that doesn't last, the music shifts into a territory of uncertainty, of anguish and distress. Belorukov seems to the one constant on all tracks, with the rhythmic instruments changing on every track. The ones in combination with the piano are by far the best one. Yet the guitar-flute duet is also not bad. 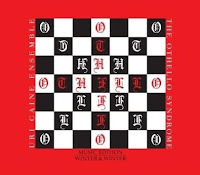 But "Adagio Cantabile", played by the whole band is surely the highlight : dark, brooding, and full of agony, like Beethoven himself, bringing a kind of avant-garde romanticism. Young musicians but with a style and musical vision all their own. Beware! Trio X is one of my favorite bands, so read my review with that knowledge in mind. 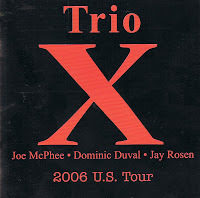 Trio X is Joe McPhee on sax and pocket trumpet, Dominic Duval on bass and Jay Rosen on drums. All three are among the best musicians in free jazz land. Trio X is the epitome of tradition-based free jazz. It is free improvisation, with the themes of some standards or spirituals, often, but not always, as an excuse for improvising, being touched upon sketchily. The "2006 U.S. Tour" is a 7-CD box with a 32-page booklet, with the performances given between October 2, 2006 and October 9, 2006. Those of you who already have Trio X albums may find some redundancy in the material, because Trio X plays many of their classics : "Motherless Child", "Blue Monk", "A Valentine Fog Of War", "Going Home", "God Bless The Child", "Evidence", but that does not really matter to me. The pieces are never the same, the sensitivity, the beauty, the subtlety, the interplay, the reverence, the solemnity, the spirituality, the intimacy, the creativity, the depth, the beauty, the beauty, the beauty, ... are to be enjoyed on each track, on each of the CDs, over and over again. And some of the pieces are played at several of the evenings, but they're never the same, and the length of the same piece can vary between five minutes to thirteen, played on tenor or soprano, played inside or outside. There are also some new pieces. On "A Waltz For Susan", McPhee gets in the same circular breathing rhythm as some of the waltzes on other albums, but here he sings while playing his sax, quite a feat, quite unusual yet it sounds great. "Colgate U" is a Jay Rosen drum solo at Colgate University, "We Do" is a Dominic Duval solo, on "The Song The Robin Sings", a slow tempo bopper, McPhee switches between pocket trumpet and tenor, and the tune is actually referencing "Stella By Starlight" in an abstract form. 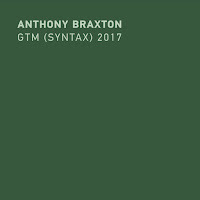 The same kind of abstraction takes place on "In Evidence", based on Monk's "Evidence", yet approached differently, ending in absolute raw and fierce blowing, with the lengthy Detroit version without a doubt the best one. McPhee's tribute to Dewey Redman, "Bringing It", is also great : free and wild, with sensitive bass at the beginning, evolving into ferocious emotional blowing with powerful (and subtle!) rhythmic support. And on the Detroit performance, "The Song A Robin Sings" is also the best version of the lot, with McPhee's trumpet playing at moments reminding me of some typical Lester Bowie inflections. Great stuff. And the sound quality is absolutely excellent, with enthusiastic and respectful audiences. I am a Trio X fan, but I can tell you : the box is worth its money. 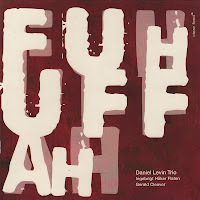 Recorded some 7 months earlier in Vilnius, Lithuania, this double LP was released by a new Lithuanian modern jazz label. I haven't listened to it yet (actually I don't have it), but part of the music was already on the DVD released earlier this year. The great thing is that they play Ornette Coleman's "Lonely Woman" and "Law Years". But why an LP? What can I do with an LP? Should you buy a record for two tracks only? Or better, just buy two tracks of the album if you can download them (soon on iTunes). Usually I like and judge albums in their entirety, yet that's not always possible. This album has two stunning highlights. One is called "Independence 2", an eleven minute track of rhythmic and musical delight, and the other one "Outhouse", a ten minute power piece, full of surprising full force subtleties. The protagonists are Norwegian super bass-player Arild Andersen, Norway-based Italian drummer Paolo Vinaccia (with whom he released several albums) and Scottish tenor saxophonist Tommy Smith. Five of the seven tracks are slow, or typically ECM-like : nice, somewhat new agey, non-comittal and well-played. But the other two tracks referred to above, are absolutely stunning. The three musicians create a powerful drive, shining all three, integrating a very fusion-oriented approach at times (everything fusion would like to be but never achieved), creating pure fury, high speed improvisation, with brilliant solos, and even more breath-taking interactions. 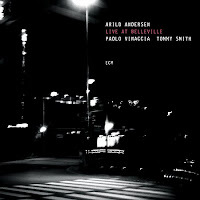 I am not sure what I should be more astonished about : Smith's unbelievable soloing (I must admit, I did not know him, but what a sax-player), Andersen's incredible precision and creativity as a bass-player (no surprise here, we know what he's capable of), Vinaccia's drumming, which is beyond belief at moments, he is hard-hitting, yet full of surprises and subtlety, or the superb interaction between all three. So, uninteresting and mellow at moments (and not for me, thank you), brilliant at others. This band's curious name is a defective anagram of De Pater Quartet, referring to Muzikantencafé De Pater in The Hague, The Netherlands, a place which this band apparently likes a lot, and for which an "r" is missing, hence the title. There is nothing wrong with the music, though, quite on the contrary. The band consists of Belgian-Italian Daniele Martini on tenor sax, Belgian-Italian pianist Giovanni di Domenico, Portuguese bassist Gonçalo Almeida who resides in Rotterdam, and Portuguese drummer João Lobo. Whatever their origin, I must again congratulate Pedro Costas of Clean Feed for his unbelievable ear for good music, and for giving young musicians the chance to have their music released. 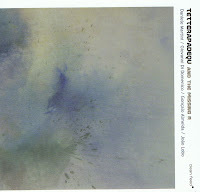 The music of Tetterapadequ consists of 13 mostly short tracks of improvised music, mostly subdued, introverted and restrained, with the exception of the third track "Dopey", which is a short drum solo. The four musicians create small creative aural environments, with scarce sounds, lots of empty space. Di Domenico's piano usually sets the tone and the scene. Although some of the sounds come from extended techniques on the various instruments, the music is very accessible and intimate, between traditional jazz (there is even a short reference to Glenn Miller's Moonlight Serenade) and modern classical music, with the other musicians taking the overall sound to a higher stage, creating depth and perspectives that are new and fresh. They are not afraid to push things to the limit, as on the last track, when the first four minutes are nothing but silence, then the bass starts playing softly, with the piano strings being plucked gently, then the drum joins sparingly, and only after eight minutes can the sax be heard, hesitatingly, sensitively, over a one note piano rhythm, yet gaining in power, gaining momentum, hypnotically, majestically, ending in a scream/cough/laugh. Nice music, very creative and subtle. Talking about substance, this album has more than plenty. Both musicians, Joëlle Léandre on bass and Ákosh Szelevényi on sax, clarinet and flutes, have stories to tell, more than one, they have a wealth of ideas even, but they are always compelling, avant-garde and free but strongly rooted in melody and even the tradition, be it of jazz or of folk music. Five years ago they released their first duo recording, Györ, recorded in a Hungarian synagogue and one which is easy to recommend. On this album they further explore the initial collaboration, with more variation and probably more focus, but a little less expansive. Both musicians are extremely versatile and expressive, and they manage to create an eery focus and coherence in their improvisations. "Part 1", the long first track is absolutely stunning, especially in the middle part, when Léandre's arco plays in the lowest registers and Ákosh's sax follows as deep as he can, then surfacing with a beautiful melody which evolves into a piercing wailing, and when the bass switches to pizzi, the sax goes down again, murmuring consent, losing its voice ... to be replaced by small bells, offering the space for the plucked bass which out of a short improv comes up with a hypnotic rhythm over which the sax comes gently screaming, beautifully, agonizingly, which can count on the immediate sympathy of the arco bass which goes even further in deepening the emotional expressiveness. The responsiveness of the two musicians is wonderful to hear, and despite the fact that most of the music is very avant-garde, they share a common lyricism and sense of melody which is rare in such a usually abstract environment, and when Léandre sings/shouts once in a while, as on "Part 2" it is both bizarre yet bluesy in its raw depth. "Part 3" is a short piece with an incantation-like solo from Akosh, with lots of central European folk influences, heart-wrenching ... and on "Part 6" Léandre plays an unbelievable arco solo, producing glissandos which are almost Indian in sound yet combined with powerful plucking. "Part 7" brings a great ending to the album, with the bass and Léandre's power-whispers providing the rhythmic base for another highly melodic improvisation by Akosh. Whether the pieces are long ("Part 5") or short ("Part 2"), the fun of listening is there all the time. Music can be great ... I love it! Download from Lulu.com for a meager 4.81 €. I think Norwegian trumpet-player Arve Henriksen is an excellent musician. I also think that German saxophonist Peter Brötzmann is an excellent and important musician. But that doesn't mean that their music is good, or at least always good. In totally different styles, both Henriksen and Brötzmann have just released albums which, to my taste, are almost substance-less. I spent my money on it. So this is a warning to those of you who happen to share the same tastes. The question is then : what is musical substance? It is not a question of rhythm or melody. You can play wonderful music without rhythm or melody. There is also plenty of music with rhythm and melody that lack substance. So what is musical substance? I think that you need the delight to hear something solid. Something with a story to tell, one that you haven't heard before, one that is not boring. A story with a clear focus, that goes somewhere, that contains true emotions, and a plot-like evolution. Something that's been thought about, even if improvised, something that's been worked on, even during rehearsals. Something that is not there to please or shock the listener, but something that the musicians want to convey, something they're eager to tell, to share, whether it's agony, pain or joy and happiness, but it has to sound true, it has to have emotional depth, and preferably also some musical inventiveness by using new forms to accentuate that story's message. Something refreshing, which forces you to hear things differently, which opens new realms of music, that surprises you, that baffles you. Something that you must be able to set your teeth in. 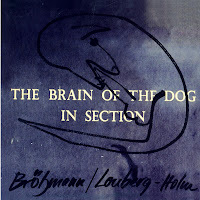 On the other opposite of the musical spectrum is this album by Brötzmann and Lonberg-Holm, inaccessible and as far removed from Henriksen's endeavor as can be, if it were not for a striking similarity in lack of substance. Brötzmann attacks the first piece in full force, as you might expect, in total disregard for the sounds of Lonberg-Holm. Halfway the first track, they find each other, but not for long. The second track is a second long piece of blowing and whining. There is no jelly here, it's an empty fragmented nutshell you're trying to crack between your teeth, hoping to get to the nut, yet there's nothing inside. Creativity and inventiveness are hard to find, and many were the moments when I was wondering whether these musicians were playing together because they wanted to or whether someone had forced them to (at gunpoint!). Listen and (don't) download Brötzmann from eMusic. 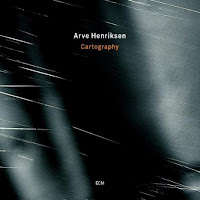 Listen and (don't) download Henriksen from iTunes. What a joy! Austrians Max Nagl, alto, and Wolfgang Reisinger, drums, are joined by Australian Clayton Thomas on bass and the ubiquitous Ken Vandermark on sax and clarinet. Nagl has this wonderful knack of using traditional material and turning it into fresh modern music, or vice versa, to improvise freely and without restrictions in various styles and modes. This album is no different, and they take on free jazz founders Ornette Coleman and Eric Dolphy, two completely different musicians and composers, but who both played a major role in turning jazz into a real art. Ornette was a visionary, with no great skills on the sax (or any instrument for that), but someone who turned music inside out, and despite the scorn he received in the early sixties, it is amazing to see how many of his compositions survive today without sounding dated. Dolphy was a stylist, a wonderful technician, who kept pushing the boundaries of jazz and improvisation from the inside out. Five tracks were penned by Dolphy (Miss Ann; GW; Something Sweet, Something Tender; The Madrig Speaks, The Panther Walks; Hat And Beard) and four by Ornette Coleman (Dee Dee; The Sphinx; Free Jazz; Researching Has No Limits). This last track by Coleman is unknown to me and only seems to appear on a Joachim Kühn album. If anyone has more info on this, please let me know. The music on this album varies between real boppy tunes, highly rhythmic and clearly structured around the core themes on the one hand, and free explorations on the other. On the first track the two saxes twirl around each other, now in unison, then in counterpoint, then improvising next to each other but with great sense of timing and great listening skills. 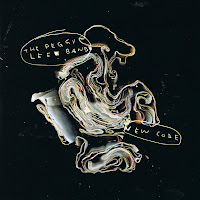 "Dee Dee" starts as free as it gets : drums and sax (Vandermark), but then halfway the joyful Coleman theme emerges, again in full unison, as a relay for Nagl to improvise over the bass in a more boppish mode. 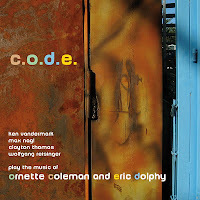 With "Free Jazz" the whole thing turns more experimental than Coleman ever was on this tune, with lots of extended techniques, Thomas on arco and Vandermark on bass clarinet, and it is only after two thirds of the track that Nagl starts playing the tune, as a sign for the band to join. After that piece, even the Dolphy tunes get their abstract versions, with lots of free improv, yet with great reverence for the composition and the composer. "The Madrig ..." brings us back to the bop tradition. The highlight of the album is "Something Sweet ..." which is played relatively outside, deeply emotional, with the bass playing a key role, and now it is halfway that the boppish harmolodic concepts of Coleman's "The Sphinx" is played, a nice turnaround and reversing of the roles between the two composers, moving back to more inside playing. A nice album with lots of variation, played by four great musicians. Technical skill on the instrument is often an impediment to creativity, but sometimes, as on this album, it can be unbelievably refreshing and inventive. 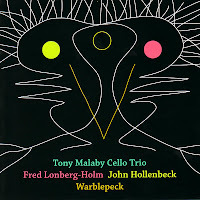 Tony Malaby's sax playing is among the best of the moment, and Fred Lonberg-Holm on cello and John Hollenbeck on percussion are two musicians with lots of musical baggage, ranging from traditional to experimental music. On Warblepeck they bring something unique : melodic power, rhythmic complexities and musical surprises that would already be great on one track, yet they keep the high quality and creativity on each of the eleven tracks. One track "Waiting Inside" is a Bill Frissell composition, brought here as improvisations around the original theme and harmonic changes. The great thing is that despite their stellar technical skills, these musicians don't take themselves too seriously, they have fun playing this music. Listen for instance to "Fly On Wall/Remolino", which starts as a playful evocation of ... well yes, a fly on a wall, with the three musicians playing as quietly as possible, yet evolving into the second part of the track which moves the piece into full frenzy and powerplay with Lonberg-Holm opening the full distortion on his cello, Hollenbeck hitting his kit as hard as possible, while Malaby screams above it all. The title track "Warblepeck" is equally fun to listen to : an odd rhythm and theme, short and repetitive, with sudden changes of tempo and polyrhythmic percussion. Or listen to "Jackhat", with its bizarre beginning, birdlike sounds, evocations of jungle sounds. Other tracks have a more serious approach, such as "Anemone" which starts with arco cello and eery chime-like percussion. When Malaby joins on sax, the piece turns into a sweet and heart-rending beauty, playing double-toned and once in while even getting flute-like sounds out of his sax. "Sky Church" is more abstract in concept, with Lonberg-Holm using many effects to great effect. The whole is a kind of "l'art pour l'art" thing, with the difference that despite the craftiness and the subtle musical explorations, the emotional component is very strong, because of Malaby's very sensitive sound, but also because of Lonberg-Holm's rich pallette and Hollenbeck's drive and sense of melody. This music is something else, and it demonstrates that avant-garde can be very accessible, rhythmic, emotional and great fun. Don't miss it. In the catalogue of late 60s and early 70s free jazz records that are currently being re-issued, this one is easy to recommend. Tenorist Byard Lancaster plays in a true post-Coltrane mode, with lots of references to the master, yet adding his own elements, from spirituals to African, sometimes more intimate, but most appealing in the longer more expansive pieces. The record starts with the very great"1324", on which Byard blows with an incredible wild intensity, subtly supported by bass and drums. The second track "Last Summer" is totally different in approach, slow, more reflective, intimate, and very Coltrane-like, also because of Sid Simmons' piano playing. Then, contrast again : "War World" is wild, starting with a drum solo of the wonderful J.R. Mitchell, joined by Lancaster after two minutes for an electrifying free duet, evolving into a trio when the arco bass joins. The next track starts in the middle of another Coltrane-like, and very varied improvisation "Live At Macalester", and the only track that appears to be really live, with a very responsive and enthusiastic audience. "World In Me", now starts with eery sounds on the bass, then develops into a free blowing romp, with several saxes, yet not credited on the liner notes, with a sudden shift to afro-cuban percussion, leading to a more contained ending. The last track is again Coltrane-ish, in very free mode though, with several horns and electric guitar. It is not always clear who plays what on which track, because all pieces seem to come from different performances. Credits are : Byard Lancaster on horns, J. R. Mitchell on percussion, Calvin Hill on bass, Paul Morrison on electric bass, Lester Lumley on conga & percussion, Sid Simmons on piano and Jerome Hunter on bass. This album is a great testimony of the best free jazz of the early 70s, showing lots of wonderful musical explorations into soul, jazz, instrumental prowess and just the fun of blowing. Not all tracks are great, but the album as a whole certainly is. 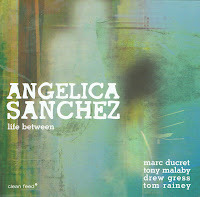 This is Angelica Sanchez' second CD as a leader, after "Mirror Me", released in 2003. She can also be heard on two albums by the Malaby/Sanchez/Rainey Trio, with her husband Tony Malaby on sax and Tom Rainey on drums. Add to this trio French guitarist Marc Ducret and bassist Drew Gress and you get this quintet. Gress, Ducret and Rainey are of course also regular collaborators of Tim Berne's many bands. Musically however, there are worlds of difference. Yes, it's still very much free with lots of improvisations, but it's less avant-garde than Tim Berne, less abrasive, a little more gentle and restrained even than the Malaby/Sanchez/Rainey Trio, more compact in any case. The pieces are composed, at least harmonically and structurally, often also thematically. This more constrained form apparently allows her, as the pianist, to move more comfortably: lyrical, gentle and emotional, using the nice tonal possibilities of her Würlitzer electric piano, while at the same time leaving lots of space to her fellow musicians. As the other soloists, both Malaby and Ducret shine. Malaby has a versatility and broadness of pallette which allows him to play in any context, Ducret is in a guitar category of his own, neither playing jazz nor rock, yet a little bit of both, and he has so much to offer in creativity and character, that even in the more subdued moments, his sometimes wild approach offers depth and new perspectives to the music. Needless to say that Drew Gress and Tom Rainey are playing at their usual high level. The music is a step further into more adventurous territory compared to Sanchez' debut album, and it is for sure a step in the right direction to my taste. The overall result is beautiful and sensitive low to mid-tempo music, flowing like a river, but one with rapids once in a while and unexpected twists and turns, offering new vistas.